Ever since British crooner and actor Richard Shelton heard Frank Sinatra sing for the first time, he has felt a strong connection to the film and music legend. "My father had a cassette of My Way, his album from 1969, and it just felt like a hand in a glove. I ended up listening to it more than my father did," Richard explains. "The first time I saw a childhood photograph of Frank Sinatra, I noticed a similarity between him and me when I was a child, and throughout my life, I keep having these incredible, inexplicable coincidences with him." Not only do the two men share an affinity for jazz, a favorite color (orange) and the same body size, EastWest Recording Studios – where Richard asks me to meet him for our interview before the final recording session for the title track of his upcoming album, An Englishman in Love in L.A. – is the exact site where Sinatra recorded "My Way" over 45 years ago. 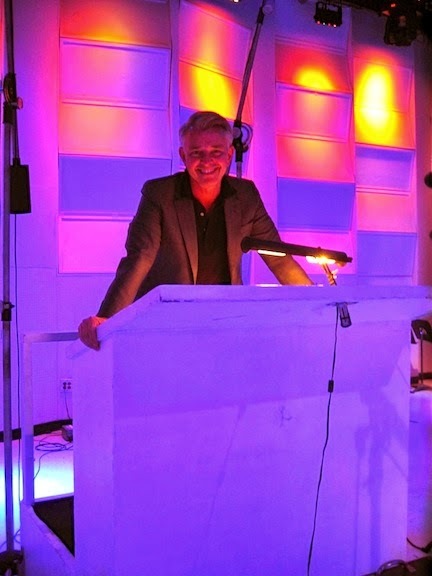 Ol' Blue Eyes and Bing Crosby were instrumental in audio engineer Bill Putnam's opening of the studios that are now EastWest in 1957, and Sinatra also laid down tracks like "Strangers in the Night," "The Lady Is a Tramp" and "That's Life" within its walls. Through the years, music of every genre has been recorded at EastWest, from the Mamas & the Papas' "California Dreamin'" and the Beach Boys' Pet Sounds to the theme songs from The Godfather, "The Monkees" and "Hawaii Five-O." In 2006, new owner Doug Rogers enlisted French designer Philippe Starck to give all the non-technical areas of the historic studios a facelift. The result is a chic yet laid back environment where artists such as Christina Aguilera, Green Day, Rage Against the Machine, Muse and now Richard Shelton have all come to create. "'My Way' was recorded right in that room. It's amazing, right? I mean, none of this was originally planned. We had finished the album but decided that there was a bit that wasn't right, and the only way to do it was to get a string section in, so we decided to try EastWest. I didn't come here because of Frank Sinatra, it just happened," he says. "This is the last section of the album, and it's exciting to be here, literally where he recorded." Richard has found the world of show business utterly thrilling since his days growing up in Wolverhampton, England. As we take a seat in one of the studio lounges, which is complete with flat-screen TV, mini-fridge and plush couches for artists to relax on between sessions, he tells me of an obsession he once had with a couple movie musicals. "I would have been 7 when I saw the film version of Oliver! with Mark Lester playing Oliver. I just started at a new school, and I told everyone that I was Mark Lester, the star of the film. The head teacher called me in and said, 'There's a story going around that you are Mark Lester. You mustn't tell people that,' but I wanted to be him so much. I was also convinced I wanted to be in The Sound of Music film. I was fascinated by it all," he laughs. "When it's warm in the summer, there's a tradition in Britain to go to theater in the outdoors at a castle or a beautiful stately home, a house belonging to royalty or the aristocracy. They open up the grounds for people to come watch plays or listen to music . I remember going to see a Shakespeare play, 'Twelfth Night,' with my parents and thinking, 'I get this. I understand everything about this.' I was only a child so it wasn't the language, the actual words but the intention and energy of what everyone was doing on stage that I understood. So it was from a very young age that I wanted to pursue this. I was prevented from doing it for a while, but I found my way back." As the son of a self-made builder's merchant, Richard was expected to take up a practical career, so he spent 13 years in hotel sales and marketing. As part of the job he was able to see the world, however, his interest in the performing arts never faded. He eventually helped set up Bridewell Theatre in Fleet Street and began acting in their first shows that included William Shakespeare's "The Merchant of Venice." He went on to tour the UK in Agatha Christie's "A Murder Is Announced" and perform in productions like "Scrooge: The Musical," the popular "EastEnders" soap opera and several commercials. Around this time, Richard began a singing career, recording an album of 1980s pop songs in jazz and titling it Retro Spectrum. He also played Frank Sinatra in "Rat Pack Confidential" and was nominated for Best Actor in a Leading Role by Manchester Evening News. Additionally, Richard's first major film appearance was as the Chairman of the Board in 2003's I Capture the Castle. "There is so much about Frank Sinatra that inspires me. I believe he always told the truth, and sometimes that made him both popular and unpopular. He told the truth when he sang, and if he liked you or didn't like you, he would express that. This honesty gives you permission to be truthful to yourself," he says. "For example, if I'm working on a piece of music or another project, it's easy to say, 'What the hell, we'll let it pass. That will be fine,' but, actually, it's never fine. You have to say, 'No, this isn't right. Let's make it right.' He was a determined, focused man who lived life to the fullest. I admire that greatly, because, what else is life for?" When we take a walk into EastWest's Studio One, it's hard not to be overcome with emotion. There is so much history within the room, the sense of greatness is palpable. When "An Englishman in Love in L.A."'s composer, Alexander Rudd, informs Richard that the conductor's platform he's standing on is the same one that has been in the room since the Sinatra sessions, they are both giddy with excitement. This isn't Richard's only brush with Sinatra while recording his new swing- and jazz-influenced album, though. "All the music was recorded at Capitol with some of his musicians: bass player Chuck Berghofer, Gregg Field his drummer (who is married to Monica Mancini the daughter of Henry Mancini – another tie-in) and trumpeter Wayne Bergeron. All these men played with Frank Sinatra at some stage," Richard informs. "The original tracks were recorded in his studio, using his microphone." Sinatra recorded the first album in the studios of Hollywood's Capitol Records Tower in 1956, Frank Sinatra Conducts Tone Poems of Color. While Richard laid down the majority of An Englishman in Love in L.A. at Capitol, it isn't his first time working in a landmark studio. His first full-length album, 2006's Top Cat, was recorded with a 65-piece orchestra at the famed Abbey Road Studios in London. "Abbey Road was slightly overwhelming. It was so impressive and big, like going into a cathedral where you just look around at the amazingness of it all. I enjoyed it, but I was very aware of the pressure," he admits. "Whereas at Capitol, I felt immediately at home. I found it more energizing at Capitol and preferred everything about it – the energy of the building, the history and the feel of it." While he covered a few Sinatra standards on Top Cat and there have been the recording studio locales in common with his, Richard stresses that his new album isn't a tribute to Sinatra at all. "There are only two songs on the album that are a bow to him, the rest is original material. That's important because I can't be Frank Sinatra. It would be arrogant of me to think I could be as good as him because I can't, but he is an inspiration to me. When I'm an actor in a show associated with him, that's a different thing because I'm channeling his energy and what he was to tell a story. This record, it's me and very separate territory," he asserts. "The title track is all about Los Angeles, being in love with the city and all the things that it promises. Within that comes disappointment, heartbreak, joy success and adventure. That's what the album is about, having a go, coming to this fabulous city and embracing it. Not taking from it, but giving to it and participating in it. It's about hope." As Richard's career continued to flourish both in the acting and singing fronts – on the daytime series "Emmerdale" for three years, on a tour of Europe as Harry Bright in "Mamma Mia!," in 2011's My Week with Marilyn and singing by private invitation for HRH Prince Charles and Sir Elton John – he decided to journey across the pond and take advantage of opportunities in Hollywood. "I love the possibility of Los Angeles. I've been here just over a year, and I regard myself as nothing more than a first-generation immigrant. I came here with hope, just as everybody came to America with hope, and I really believe that America still offers that to the world," he says. "I love being British. I love London and am passionate about it, but I wanted to discover new things about myself and life. I felt that the place to try that was Los Angeles." In his time here so far, Richard has come to have a few regular haunts throughout the city. "I love going to Soho House because it's beautiful, glamorous and the view is spectacular. I'm lucky enough to be a member there because I was a member in London. I like hiking in Fryman Canyon and Runyon Canyon. I feel on top of the world when I go to those places. I love Los Feliz – going to Rockwell where Jeff Goldblum plays jazz on Wednesday nights, I've sat in with him and his jazz band [the Mildred Snitzer Orchestra] several times, and Marty and Elayne at the Dresden Room are sensational, show business legends." As for places near his Laurel Canyon neighborhood, Richard likes going to the Studio City Farmers Market and a place that is his favorite shop in the whole of Los Angeles, Laurel Canyon Country Store. "It sells everything, from newspapers to French bread. There's a British section of confectionary, jams, marmalade. I like it because you can buy fresh food or a coffee there, and it has a good atmosphere. When I first went in and the owner realized I was British, he showed me the section," Richard recalls. "Children in Britain grow up with a chocolate bar called Cadbury Flake, and the owner told me, 'This is where David Bowie buys his Cadbury Flake, and also James Bond.' I said, 'Oh really, which one?' 'All three,' he replied." In addition to putting the finishing touches on An Englishman in Love in L.A., Richard currently has two films in post-production, the drama Brash Young Turks and the film adaptation of spy thriller Joker Game. He makes his U.S. television debut this weekend in the Showtime series "House of Lies," which stars Don Cheadle and Kristen Bell, and is part of a live radio reading of Eric Rudnick's "Day Trader." "We had a table read with the rest of the cast, and they were tremendous. What I'm enjoying about being in Los Angeles is collaborating. I'm learning so much about the American way of doing things," he says. "There's a young girl in the play [Brighid Fleming] who is very good. I found myself watching her, amazed at how she was interpreting this role because she's American and the piece is American, so it works very well. It's a brilliant experience for me to be learning while I'm here in Los Angeles. It's exciting." Richard Shelton embraces everything he does with excitement, whether he's acting or making music. His energy is infectious, and as he greets the team in the production booth led by sound engineer Steve Genewick, I can't help remembering words he said earlier in the lounge about the what he loves most about performing. "For me, it's about giving. What I enjoy is creating. As an actor, I enjoy playing unattractive roles, difficult characters and possibly unsympathetic ones because there's more of a story to tell. It's easier perhaps to be likable or nice, but those characters are not as interesting as a ones who have an edge. You wonder why this person is like this, and I enjoy that sense of revealing, bit by bit, what this character is about to an audience," he utters. "With music, you're also giving, but it's a very different dynamic. It's instant, and you can influence people's moods. You can make them happy or sad, smile or dance, and that's a wonderful thing to do. It's all about what you give." An Englishman in Love in L.A. will be available this summer. "House of Lies" airs Sundays at 10 p.m. on Showtime. The live reading of "Day Trader" will be broadcast via UBN Radio's Interweb Playhouse March 29 at 2 p.m. For more information, visit richardshelton.co.uk.